Significant disparity exists among clinicians, with less than half performing any sort of screening for vitamin D status and bone health in patients with epilepsy. The existing guidelines are inconsistent. The International Society for Clinical Densitometry has not specified epilepsy in its recent position development statement  as an indication for bone mineral density measurements in children. A Cochrane review  in 2009, which did not include a recent randomized controlled trial,  found no reliable evidence to support the routine use of vitamins in patients with epilepsy. The American Academy of Pediatrics has recommended that all children receive 400 IU of vitamin D supplements as infants and continue through adolescence, but does not recommend vitamin D doses specifically for children on antiseizure drugs. However, a recent systematic review and meta-analysis of randomized controlled trials concluded that vitamin D supplementation is not effective in improving bone mineral density in healthy children and adolescents,  but suggested that supplementation of deficient children may be clinically useful. 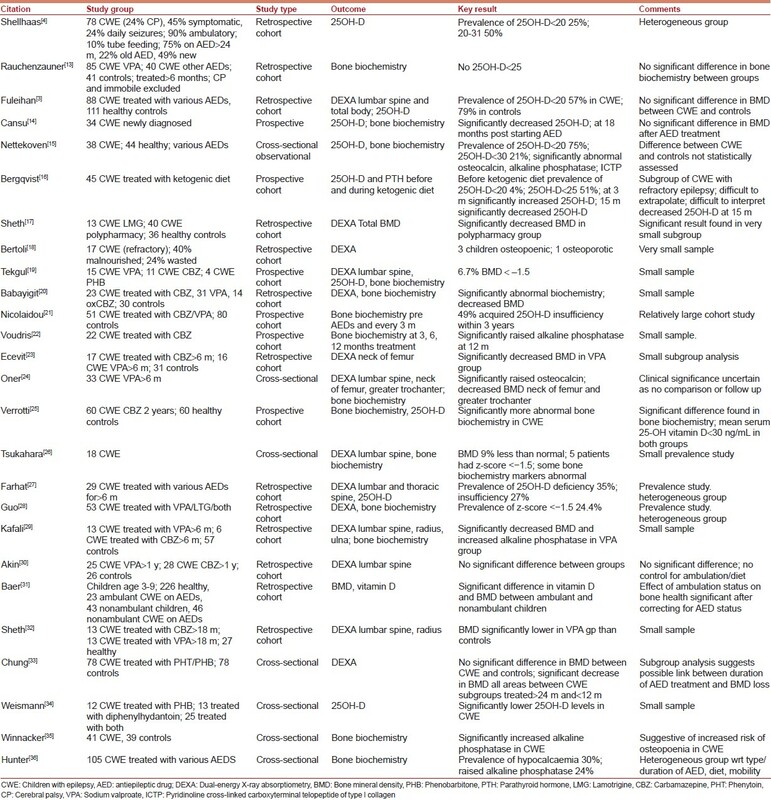 [Table 1] lists 26 articles which are studies of markers of bone health in children with epilepsy. There are 14 cohort studies comparing bone mineral density and/or bone biochemistry in children treated with antiepileptic drugs and healthy controls. Of these, seven studies found a significant difference, four found no significance, and three studies did not comment on the statistical significance of any difference between the groups. There are 12 cohort studies observing bone mineral density and/or bone biochemistry in children treated with antiepileptic drugs. These found a prevalence of 25-OH vitamin D levels less than 20 of between 25% and 75% in children treated with antiepileptic drugs (with varying degrees of ambulation, duration of epilepsy, and number of antiepileptic drugs). There is great variation between studies in terms of controlling for confounding factors (e.g. mobility and diet). 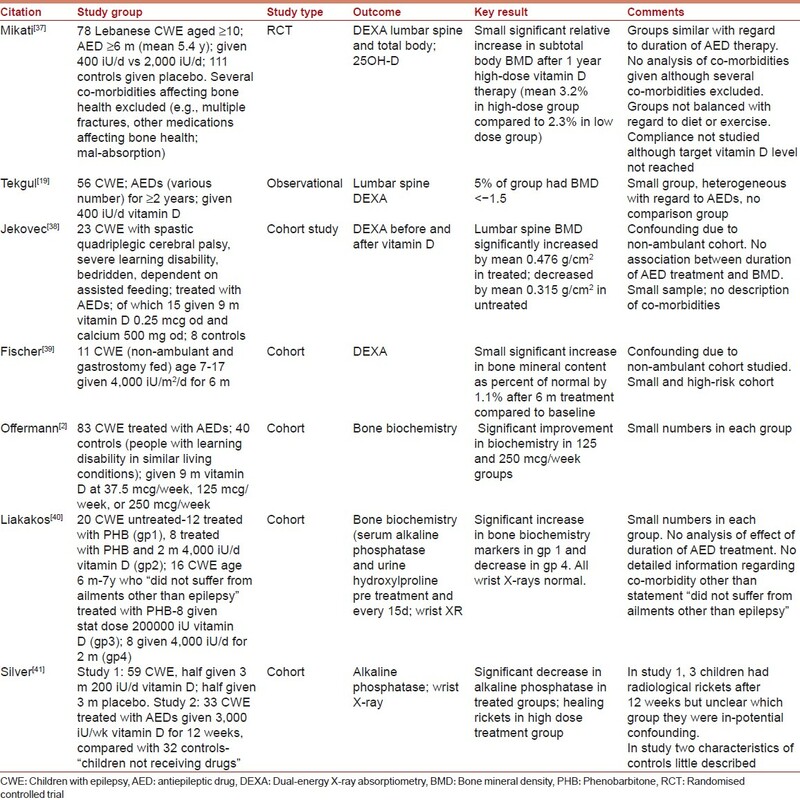 [Table 2] shows six studies of vitamin D therapy in children treated with antiepileptic drugs (AEDs). The only randomized controlled trial  was limited in terms of duration of therapy, lack of controlling for diet/exercise, and lack of study of compliance despite not attaining target vitamin D levels. It demonstrated no significant difference between high- and low-dose vitamin D, and no change in bone mineral density compared to healthy controls after 1 year of treatment. This may be a better outcome than in unsupplemented children with epilepsy whose bone mineral density has been shown to decrease with time in previous studies. Two cohort studies showed a significant increase in bone mineral density (one large and one small), two cohort studies showed a significant improvement in bone biochemistry, and one cohort study showed a significant improvement in bone biochemistry and healing of rickets with vitamin D therapy. Three of the six studies used bone biochemistry as an indirect marker of bone health, rather than bone mineral density. It is difficult to compare the bone mineral density improvements as the studies use different units rather than a standardized z-score. As there is little description of comorbidities (the RCT is the only study to give a detailed description of comorbidities), there is potential for confounding with regard to comorbidities, such as mal-absorptive disorders, treatment with drugs other than AEDs which may affect bone health, nutrition, and immobility in those studies not pre-selecting an immobile group. Most of the studies of bone mineral density markers in children with epilepsy [Table 1] have found little significant difference in bone mineral density markers in children with epilepsy. However, these studies may be biased as most included a small sample, and did not include large enough numbers to enable comparison between specific antiepileptic drugs or therapies, or between different epileptic syndromes. Of those studies in which this comparison was attempted, a significant association between sodium valproate and markers of poor bone health was found; but as this was only in small numbers, it might represent a spurious association that has not been excluded. In addition, many of the studies did not correct for confounding factors such as mobility, nutrition, and obesity. One small study that considered the effect of ambulatory status  did however, find a significant difference in bone health between ambulant and non-ambulant children. Studies of vitamin D therapy in children with epilepsy have been similarly limited by lack of stratification with regard to factors that influence bone health such as comorbidities, nutrition, obesity, and mobility. Hence although there is little evidence for an effect, there is limited evidence for no effect. The only randomized controlled trial  was limited in terms of duration of therapy, lack of controlling for diet/exercise, and lack of study of compliance despite not attaining target vitamin D levels. 1. Kumar J, Muntner P, Kaskel FJ, Hailpern SM, Melamed ML. Prevalence and associations of 25-hydroxyvitamin D deficiency in US children: NHANES 2001-2004. Pediatrics 2009;124:e362-70. 2. Offermann G, Pinto V, Kruse R. Antiepileptic drugs and vitamin D supplementation. Epilepsia 1979;20:3-15. 3. El-Hajj Fuleihan G, Dib L, Yamout B, Sawaya R, Mikati MA. Predictors of bone density in ambulatory patients on antiepileptic drugs. Bone 2008;43:149-55. 4. Gniatkowska-Nowakowska A. Fractures in epilepsy children. Seizure 2010;19:324-5. 5. Souverein PC, Webb DJ, Petri H, Weil J, Van Staa TP, Egberts T. Incidence of fractures among epilepsy patients: A population-based retrospective cohort study in the General Practice Research Database. Epilepsia 2005;46:304-10. 6. Shellhaas RA, Barks AK, Joshi SM. Prevalence and risk factors for vitamin D insufficiency among children with epilepsy. Pediatr Neurol 2010;42:422-6. 7. Valmadrid C, Voorhees C, Litt B, Schneyer CR. Practice patterns of neurologists regarding bone and mineral effects of antiepileptic drug therapy. Arch Neurol 2001;58:1369-74. 8. Baim S, Binkley N, Bilezikian JP, Kendler DL, Hans DB, Lewiecki EM, et al. Official Positions of the International Society for Clinical Densitometry and Executive Summary of the 2007 ISCD Position Development Conference. J Clin Densitom 2008;11:75e91. 9. Ranganathan LN, Ramaratnam S. Vitamins for epilepsy (Review): The Cochrane Library. London: John Wiley and Sons, Ltd; 2009. 10. Mikati MA, Dib L, Yamout B, Sawaya R, Rahi AC, Fuleihan Gel-H. Two randomized vitamin D trials in ambulatory patients on anticonvulsants: Impact on bone. Neurology 2006;67:2005-14. 11. Wagner CL, Greer FR. Section on breast feeding and committee on nutrition. Prevention of rickets and vitamin D deficiency in infants, children, and adolescents. Pediatrics 2008;107:1014-8. 12. Winzenberg T, Powell S, Shaw KA, Jones G. Effects of vitamin D supplementation on bone density in healthy children: Systematic review and meta-analysis. BMJ 2011;342:c7254. 13. Rauchenzauner M, Griesmacher A, Tatarczyk T, Haberlandt E, Strasak A, Zimmerhackl LB, et al. Chronic antiepileptic monotherapy, bone metabolism, and body composition in non-institutionalized children. Dev Med Child Neurol 2010;52:283-8. 14. Cansu A, Yesilkaya E, Serdaroðlu A, Hirfanoðlu TL, Camurdan O, Gülbahar O, et al . Evaluation of bone turnover in epileptic children using oxcarbazepine. Pediatr Neurol 2008;39:266-71. 15. Nettekoven S, Ströhle A, Trunz B, Wolters M, Hoffmann S, Horn R, et al. Effects of antiepileptic drug therapy on vitamin D status and biochemical markers of bone turnover in children with epilepsy. Eur J Pediatr 2008;167:1369-77. 16. Bergqvist AG, Schall JI, Stallings VA. Vitamin D status in children with intractable epilepsy, and impact of the ketogenic diet. Epilepsia 2007;48:66-71. 17. Sheth RD, Hermann BP. Bone mineral density with lamotrigine monotherapy for epilepsy. Pediatr Neurol 2007;37:250-4. 18. Bertoli S, Cardinali S, Veggiotti P, Trentani C, Testolin G, Tagliabue A. Evaluation of nutritional status in children with refractory epilepsy. Nutr J 2006;5:14. 19. Tekgul H, Serdaroglu G, Huseyinov A, Gökben S. Bone mineral status in pediatric outpatients on antiepileptic drug monotherapy. J Child Neurol 2006;21:411-4. 20. Babayigit A, Dirik E, Bober E, Cakmakci H. Adverse effects of antiepileptic drugs on bone mineral density. Pediatr Neurol 2006;35:177-81. 21. Nicolaidou P, Georgouli H, Kotsalis H, Matsinos Y, Papadopoulou A, Fretzayas A, et al. Effects of anticonvulsant therapy on vitamin D status in children: Prospective monitoring study. J Child Neurol 2006;21:205-9. 22. Voudris KA, Attilakos A, Katsarou E, Garoufi A, Dimou S, Skardoutsou A, et al. Early alteration in bone metabolism in epileptic children receiving carbamazepine monotherapy owing to the induction of hepatic drug-metabolizing enzymes. J Child Neurol 2005;20:513-6. 23. Ecevit Ç, Aydoðan A, Kavakli T, Altinöz S. Effect of carbamazepine and valproate on bone mineral density. Pediatr Neurol 2004;31:279-82. 24. Oner N, Kaya M, Karasalihoðlu S, Karaca H, Celtik C, Tütüncüler F. Bone mineral metabolism changes in epileptic children receiving valproic acid. J Paediatr Child Health 2004;40:470-3. 25. Verrotti A, Greco R, Latini G, Morgese G, Chiarelli F. Increased bone turnover in prepubertal, pubertal, and postpubertal patients receiving carbamazepine. Epilepsia 2002;43:1488-92. 26. Tsukahara H, Kimura K, Todoroki Y, Ohshima Y, Hiraoka M, Shigematsu Y, et al. Bone mineral status in ambulatory pediatric patients on long-term antiepileptic drug therapy. Pediatr Int 2002;44:247-53. 27. Farhat G, Yamout B, Mikati MA, Demirjian S, Sawaya R, El-Hajj Fuleihan G. Effect of antiepileptic drugs on bone density in ambulatory patients. Neurology 2002;58:1348-53. 28. Guo CY, Ronen GM, Atkinson SA. Long-term valproate and lamotrigine treatment may be a marker for reduced growth and bone mass in children with epilepsy. Epilepsia 2001;42:1141-7. 29. Kafali G, Erselcan T, Tanzer F. Effect of antiepileptic drugs on bone mineral density in children between ages 6 and 12 years. Clin Pediatr (Phila) 1999;38:93-8. 30. Akin R, Okutan V, Sarici U, Altunbas A, Gökçay E. Evaluation of bone mineral density in children receiving antiepileptic drugs. Pediatr Neurol 1998;19:129-31. 31. Baer MT, Kozlowski BW, Blyler EM, Trahms CM, Taylor ML, Hogan MP. Vitamin D, calcium, and bone status in children with developmental delay in relation to anticonvulsant use and ambulatory status. Am J Clin Nutr 1997;65:1042-51. 32. Sheth RD, Wesolowski CA, Jacob JC, Penney S, Hobbs GR, Riggs JE, et al. Effect of carbamazepine and valproate on bone mineral density. J Pediatr 1995;127:256-62. 33. Chung S, Ahn C. Effects of antiepileptic drug therapy on bone mineral density in ambulatory epileptic children. Brain Dev 1994;16:382-5. 34. Weisman Y, Andriola M, Reiter E, Gruskin A, Root A. Serum concentrations of 25-hydroxy vitamin D in Florida children: Effect of anticonvulsant drugs. South Med J 1979;72:400-1, 408. 35. Winnacker JL, Yeager H, Saunders JA, Russell B, Anast CS. Rickets in children receiving anticonvulsant drugs. Biochemical and hormonal markers. Am J Dis Child 1977;131:286-90. 36. Hunter J, Maxwell JD, Stewart DA, Parsons V, Williams R. Altered calcium metabolism in epileptic children on anticonvulsants. Br Med J 1971;4:202-4. 37. Mikati MA, Dib L, Yamout B, Sawaya R, Rahi AC, Fuleihan Gel-H. Two randomized vitamin D trials in ambulatory patients on anticonvulsants: Impact on bone. Neurology 2006;67:2005-14. 38. Jekovec-Vrhovsek M, Kocijancic A, Prezelj J. Effect of vitamin D and calcium on bone mineral density in children with CP and epilepsy in full-time care. Dev Med Child Neurol 2000;42:403-5. 39. Fischer MH, Adkins WN Jr, Liebl BH, VanCalcar SC, Marlett JA. Bone status in nonambulant, epileptic, institutionalized youth. Improvement with vitamin D therapy. Clin Pediatr (Phila) 1988;27:499-505. 40. Liakakos D, Papadopoulos Z, Vlachos P, Boviatsi E, Varonos DD. Serum alkaline phosphatase and urinary hydroxyproline values in children receiving phenobarbital with and without vitamin D. J Pediatr 1975;87:291-6. 41. Silver J, Davies TJ, Kupersmitt E, Orme M, Petrie A, Vajda F. Prevalence and treatment of vitamin D deficiency in children on anticonvulsant drugs. Arch Dis Child 1974;49:344-50.